With the map of Ireland spread before me like a buffet table crammed with one delicious dish after another, I struggled to decide where to go on my family’s first visit to Ireland this past March. 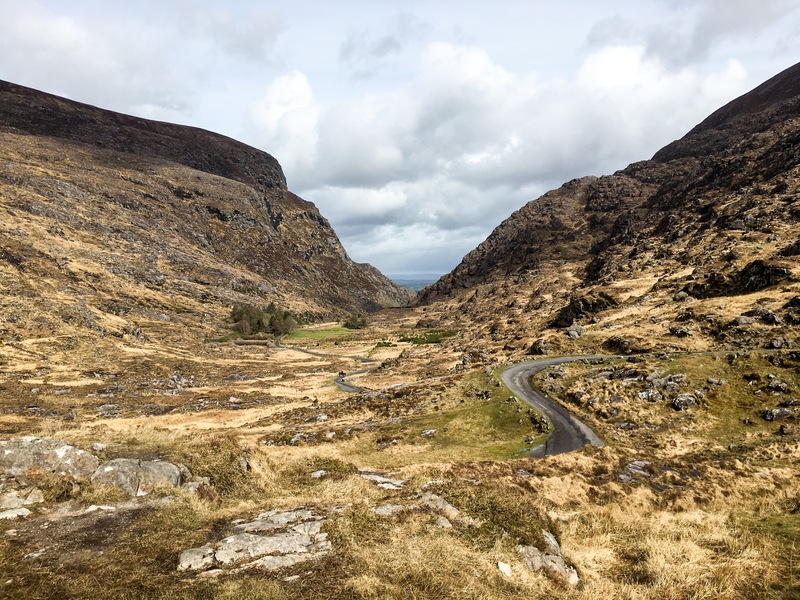 From Donegal in the far north to Cork and Kerry in the south, from the west coast’s Cliffs of Moher in County Clare due east to Dublin, and everything in between, it was hard to choose when nearly every one of Ireland’s 32 counties made my mouth water. But five and a half days and six nights was clearly not enough time to see it all. 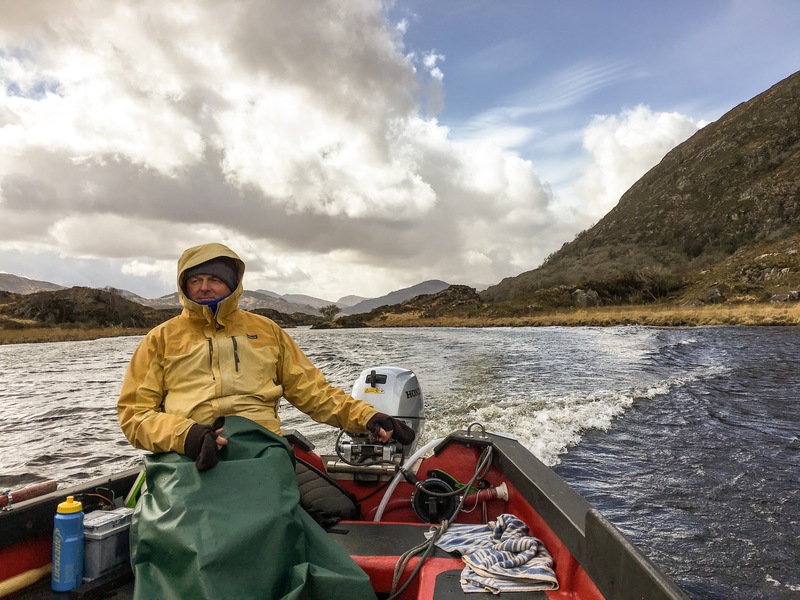 Not wanting to bite off more than we could chew, we decided to spend three nights in County Kerry and three nights in Dublin, exploring a bit of West Cork and the Tipperary countryside as well along the way. Here are the highlights from our short but sweet visit to Ireland . 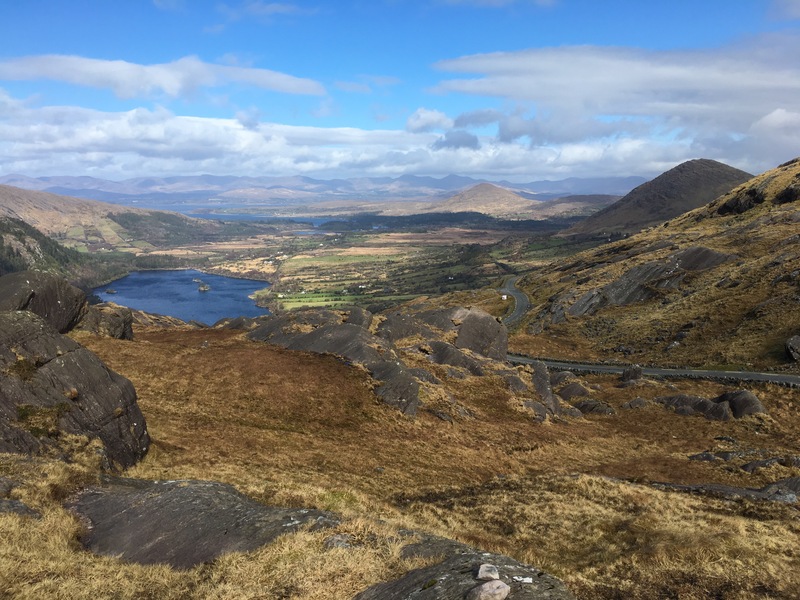 . .
Our trip began in Ireland’s spectacular far southwest, where County Kerry and the western reaches of County Cork meet the Atlantic in a series of rugged peninsulas that trail like tattered coattails off the Emerald Isle’s backside. While the Iveragh Peninsula, the largest, with it’s “Ring of Kerry” driving route is the most popular among tourists, and the Dingle Peninsula, the northern-most, is Rick Steves’ personal favorite, we chose to explore the lesser-traveled Beara Peninsula, which has the distinction of belonging to both counties Kerry and Cork. We could have spent the entire day meandering around Beara, with all it’s nooks, crannies and points of interest. In particular, I would have loved to have seen one or two of the peninsula’s many bronze age stone circles, to have walked along its coastal trails, to have lingered over a pint of Guinness in a seaside pub (McCarthy’s Bar in Casteletownbere came recommended), and to have braved the rickety, 1960’s-era cable car — the only one in Ireland — for a ride from the tip of the peninsula to windswept Dursey Island. But with only two days to see as much as possible in the Kerry / West Cork area (including a sheep dog demonstration scheduled for later that day), we had to keep things moving and mostly experienced Beara from the inside of our rental car. 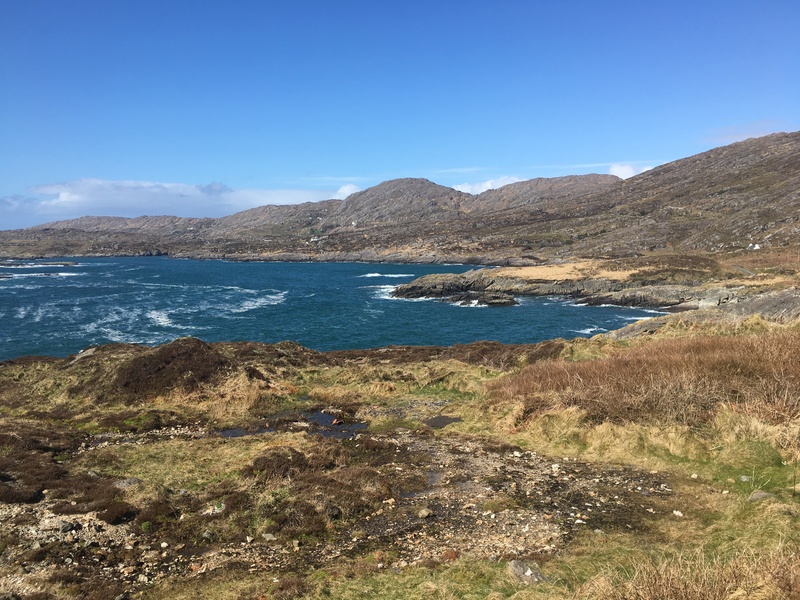 As we sped along on Beara’s winding, narrow, and blessedly deserted roads, mountains, cliffs ocean, sheep, cows and colorfully painted villages passed before our eyes in a beautiful blur. 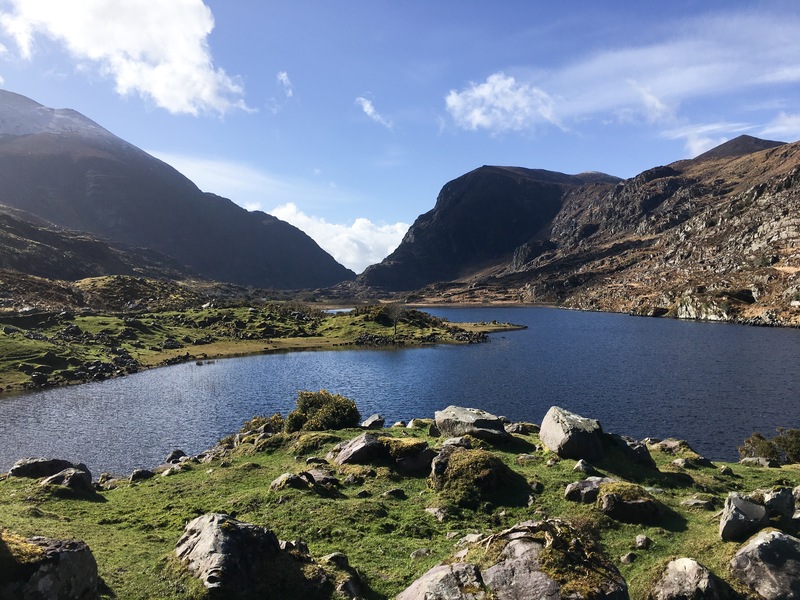 We did manage a couple quick stops along the way, including one to take in the views and clamber around in the rocks at Healy Pass, built during the famine times in 1847 to “help prevent starvation” by connecting the Cork and Kerry sides of the peninsula to each other. We also had a nice lunch of quiche, pastries and tea at cozy Harrington’s Post Office and Coffee Shop in the crayon-box village of Ardgroom. Beara Peninsula view to the north from Healy Pass: Glanmore Lake, the Caha Mountains and the Iveragh Penninsula in the distance. 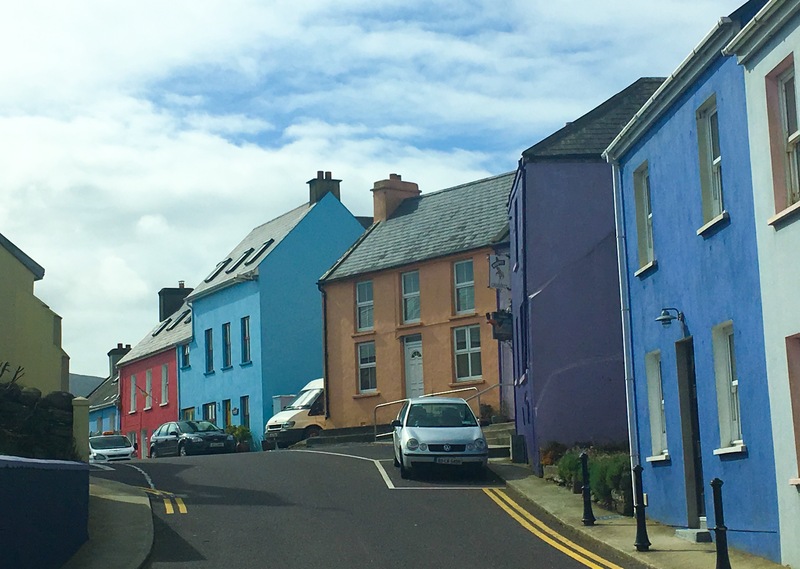 The Beara Peninsula town of Eyeries, County Cork, with its colorfully painted houses. 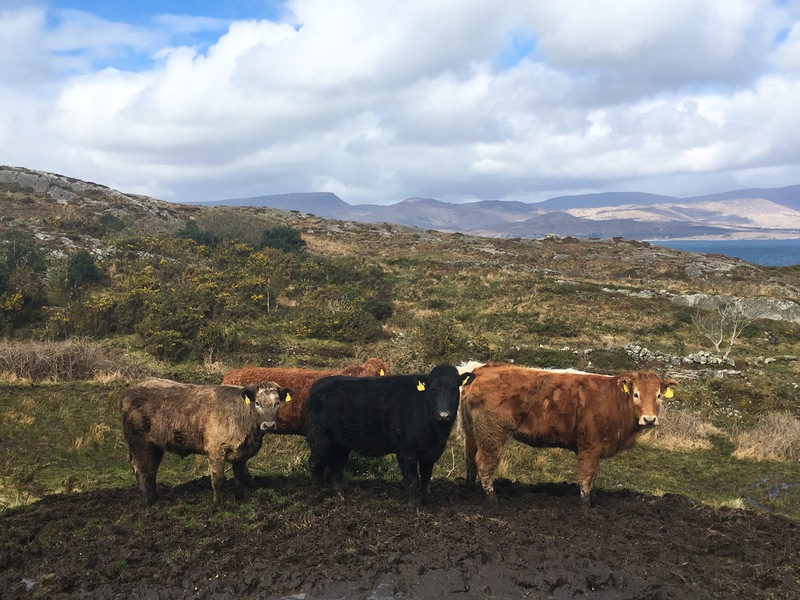 Irish cows along the coastal road between Ardgroom and Eyeries, on the north side of the Beara Peninsula. The northern coast of Beara near the town of Allihies, County Cork. 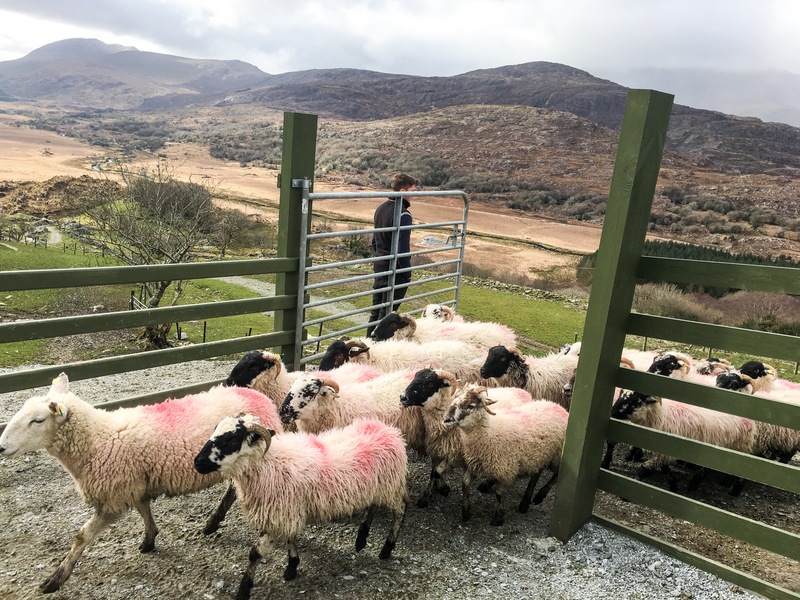 After completing our drive around the Beara Peninsula, we raced north up and over scenic Moll’s Gap on the Ring of Kerry, making it to the Kissane Sheep Farm just in time for a late afternoon sheep dog demonstration. 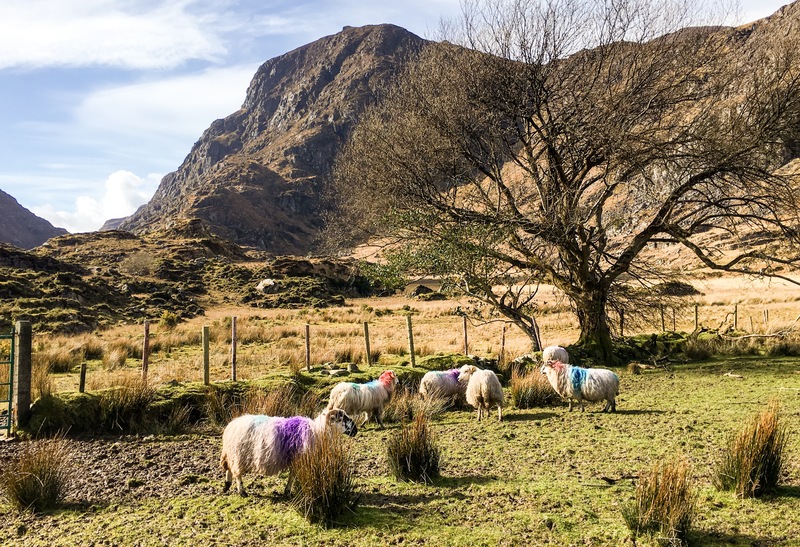 Located on several thousand acres of land bordering Killarney National Park and the foothills of Ireland’s highest mountains, the MacGillycuddy’s Reeks, this home to hundreds of shaggy Irish mountain sheep and a dozen or so border collies looked more like a wilderness area than a farm. Not a bad place to earn a living, as the Kissane family has done for over 200 years, or, for that matter, to be a sheep. The sheep dog demonstration, which involved several dozen sheep, one small border collie and the dog’s trainer, took place on a green hillside a short walk from the barn where we checked in for our visit. Standing behind a fence, we watched from above as the dog, following the monosyllabic commands of his trainer, herded the sheep every which way around the sloping meadow before eventually rounding them up into a pen. It was impressive, not to mention highly entertaining, to see how one small dog could control such a large group of animals at least twice the size of him. 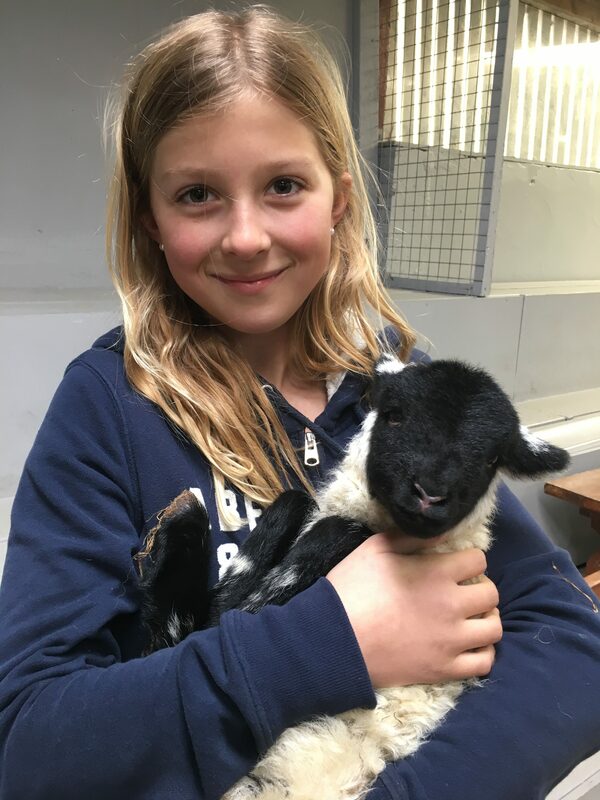 For our twelve year-old daughter, Astrid, the best part of our visit came after the sheep dog demonstration, when she got to hold a day-old lamb. This being early Spring, the barn was like a maternity ward, echoing with the high pitched bleats and deep baaas of the lambs and their mamas. Astrid snuggled with her little black and white baby for a good fifteen minutes, vowing never again to eat lamb (she’d had a tasty and now much regretted lamb stew the night before for dinner) and trying to convince us that we should move to a farm. Sheep returning to their pen after a sheep dog demonstration at Kissane Sheep Farm near Moll’s Gap, County Kerry. My daughter, Astrid, with a day-old lamb at Kissane Sheep Farm, County Kerry. 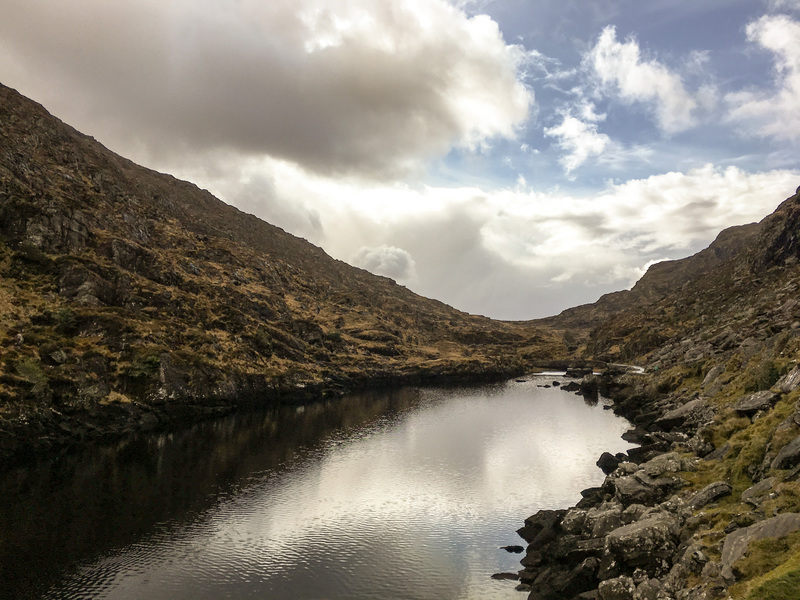 On the agenda for our second day in Kerry was a combination hike and guided boat trip through the Gap of Dunloe and Lakes of Killarney. While other companies offer similar excursions, we went with O’Connors Traditional Pub in Killarney, which transported us by vintage bus to Kate Kearney’s Cottage, a 19th century country pub that figures into local folklore and from which the hike began. Hiking is not the only way to see the Gap of Dunloe, however, some people opting to travel the paved road through this narrow mountain pass between the MacGillycuddy’s Reeks and Purple Mountain by bike, horse drawn “jaunting cars,” or automobile (fortunately, there weren’t too many of the latter.) We said goodbye to our driver, who would meet us at the end of the hike for the boat tour, and set off on foot. Running north to south just beyond the western limits of Killarney National Park, the seven mile Gap of Dunloe route took us through a dramatic landscape of rocky hills and meadows that were still transitioning from a winter palate of olive, brown and tan to the shamrock green of summer. Moody and textured, it was a duskier shade of Ireland than I’d envisioned, but stunning nonetheless. Against this backdrop, the tiny, bright yellow blooms of the furze (also known as whin, broom or gorse), a thorny, native shrub that grows all over Ireland, practically glowed. Startling splotches of pink, purple, blue and green on the woolly bodies of grazing sheep added yet more color to the early spring countryside. We passed the last of a series of small, black lakes, their surfaces mirroring increasingly cloudy skies, and followed the curving road up to the head of the gap. After a quick stop to admire the views and have a snack, it was down the other side into the Black Valley, and on to Lord Brandon’s Cottage, the ruins of a 19th century hunting lodge turned cafe. Here we boarded a shallow, open motorboat with our guide and one other passenger and slowly made our way through the string of three connected lakes that make up the Lakes of Killarney: from the smallest, Upper Lake, through a winding channel into Muckross Lake and onto the largest of the three, Lough Leane. In a thin drizzle, our guide pointed out some of the major sights along the way, like the slopes of the surrounding MacGillycudy Reeks, Ireland’s highest mountains; a nesting area for white-tailed eagles, which were hunted to extinction in the 19th century and reintroduced to the region in 2007; Inisfallen Island in Lough Leane, the site of an atmospheric monastery founded by St. Finian in 640; and Ross Castle, along the shores of Lough Leane where we finally disembarked. Black Lake on the hike from Kate Kearney’s Cottage to Lord Brandon’s Cottage, through the Gap of Dunloe, County Kerry. Auger Lake on the hike from Kate Kearney’s Cottage to Lord Brandon’s Cottage, through the Gap of Dunloe, County Kerry. Looking north over the Gap of Dunloe from the Head of the Gap, on the Gap of Dunloe hike, County Kerry. Technicolor sheep along the Gap of Dunloe hike. 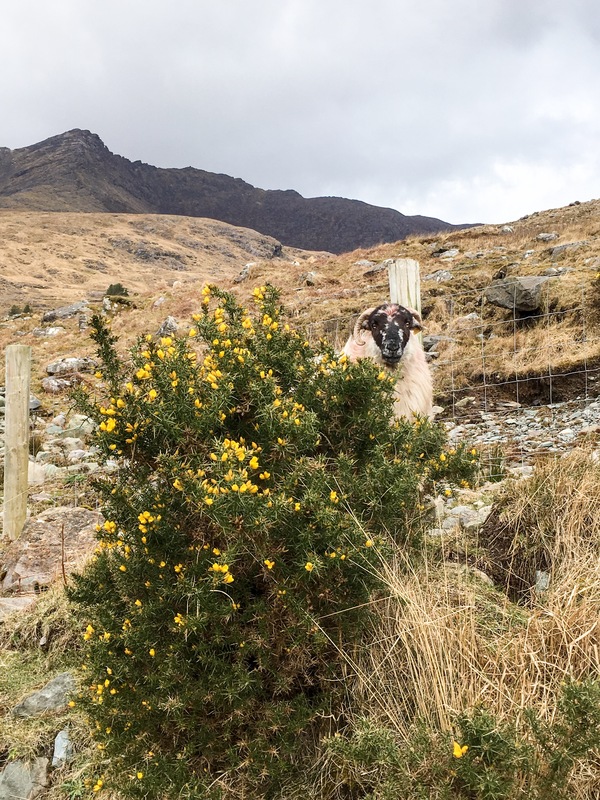 Sheep and furze shrub in the Black Valley on the Gap of Dunloe Hike, County Kerry. 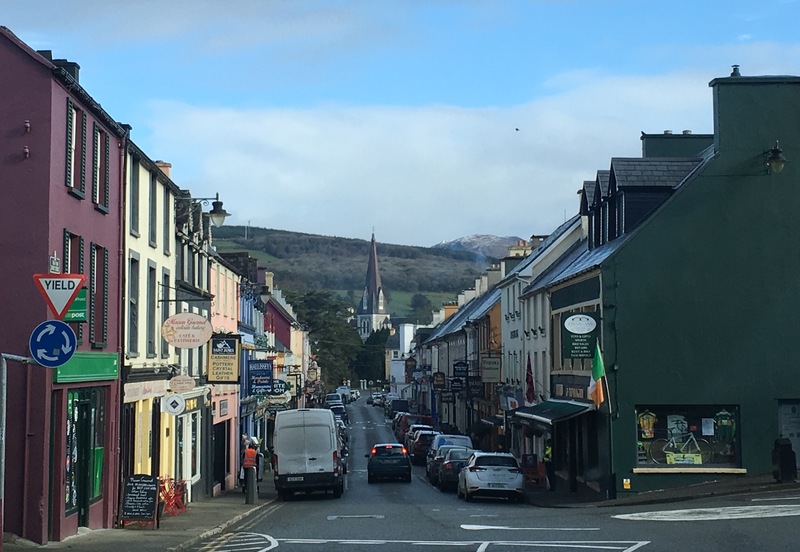 During our time in the County Kerry / West Cork area, we stayed in Kenmare, a cheerful little town that sits along both the Iveragh and Beara peninsula driving routes in the crook of a narrow bay. 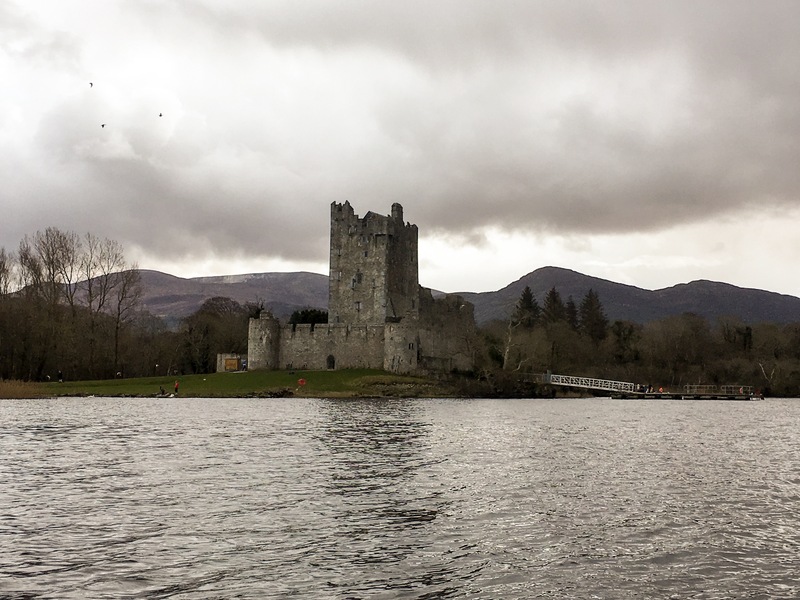 As we had hoped, Kenmare turned out to be a great base for exploring County Kerry and West Cork, and we were glad we’d decided to stay here, rather than Killarney, County Kerry’s larger and busier tourist hub to the north. Chockablock with restaurants, pubs and shops, Kenmare’s tidy, triangle-shaped commercial area along Henry, Main and Shelbourne Streets, was a pleasant place to stroll around after our excursions in the surrounding countryside. We had a good meal at upscale Packie’s on our first night and an even better one at casual P.F. McCarthy on the second (their tasty homemade beef meatloaf was delicious) and enjoyed browsing and chatting with the shopkeeper at The Soundz of Muzic, a friendly, closet-sized shop specializing in folk music, that’s filled floor to ceiling with musical instruments, books and curios. We’ll have to return to try Horseshoe, a gastropub recommended for its local mussels and lamb, which was unfortunately closed while we were there, and I’d also like to see Kenmare’s bronze age stone circle, known as “The Shrubberies” which we failed to stumble upon during our brief stay. 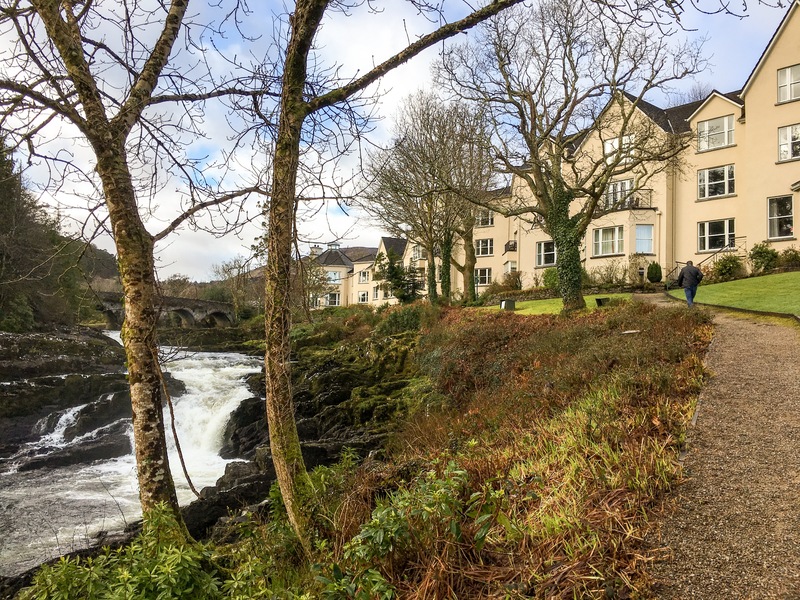 We were extremely pleased with our accommodations at the Sheen Falls Country Club, located about three kilometers from Kenmare’s town center on the south side of the Kenmare River. An immaculate and tastefully appointed two-story townhouse with three bedrooms, three and a half bathrooms, a spacious living room, dining area and kitchen stocked with milk, bread and other staples upon our arrival, this was probably the most comfortable place I have ever stayed with my family on vacation and the best deal we’ve ever managed to score at 140 Euros per night. And though we did not make much use of it, it was nice to have access to classy Sheen Falls Lodge across the road, with it’s cozy lounge areas, gourmet restaurant and old school cocktail bar. Henry Street in downtown Kenmare, County Kerry. Sheen Falls Lodge and its namesake in Kenmare, County Kerry. 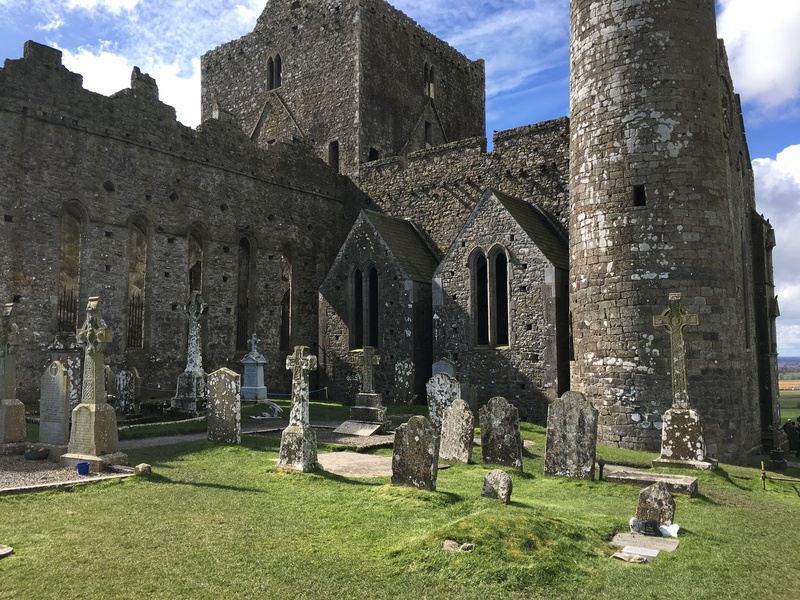 Another highlight of our trip to Ireland was the Rock of Cashel in County Tipperary, which we visited on our way from Kenmare to Dublin. A massive limestone outcropping crowned by a cluster of crumbling, medieval buildings, the Rock was an important power center for a succession of Irish clans, kings and clergy over the course of more than a thousand years (“cashel” is an anglicized version of the Irish “caiseal” or “fortress”). 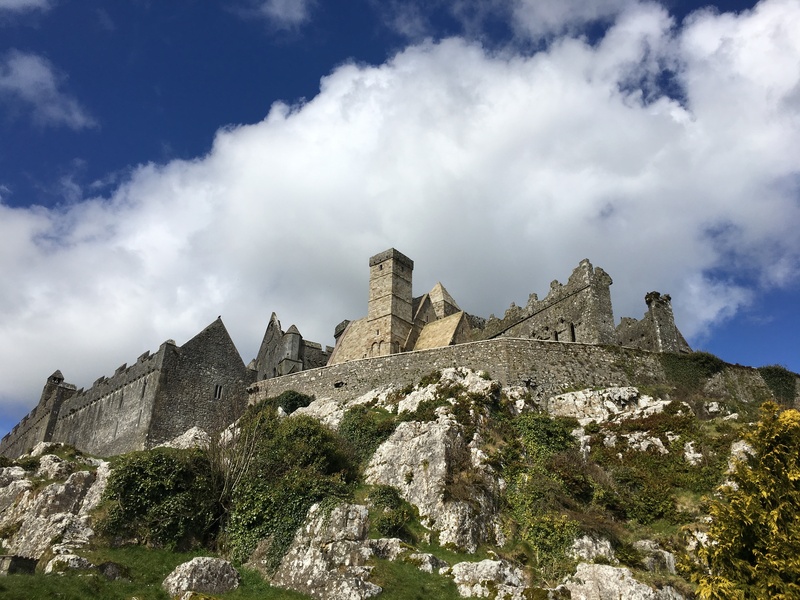 With 360 degree views stretching over the town of Cashel, the surrounding countryside and far into the distance, the Rock’s strategic significance was easy to appreciate. I was also in full agreement with Lonely Planet’s description of the Rock as “one of Ireland’s most spectacular archaeological sites,” although I have to admit that this was the only such site we managed to squeeze into our itinerary. After a quick stop for a souvenir Rock of Cashel crushed penny at a shop at the base of the Rock (our younger daughter, Annika, is an avid crushed penny collector), we made our way up the hill, arriving just in time for what turned out to be a very thorough and informative guided tour (included in the price of admission) of the Rock’s various buildings and other features. As we learned, while many a fortress has stood here over the centuries, the buildings that remain are mostly of a religious nature, including a grand, though partially roof-less, Gothic cathedral with an adjoining, four-story archbishop’s residence; a chapel believed to be the first Romanesque church in Ireland and final resting place of King Cormac, one of Ireland’s so-called “High Kings;” and a 15th century building that originally housed the cathedral’s choristers, and now contains a small museum of assorted relics. There was also an intriguing, 28-meter tall round tower dating to the 11th or 12th centuries — the oldest building on the Rock — the doorway to which is oddly 3.5 meters above the ground; a replica of St. Patrick’s Cross (the original is on view in the museum) at the site where St. Patrick is said to have converted another Irish High King by the name of Aengus to Christianity in the 5th century; and a sprawling graveyard, where weather-beaten tombstones and Celtic crosses sprout haphazardly from the grass. Our excellent guide filled us in on the history and lore of all of these ancient edifices and artifacts, making our visit much more educational than had we chosen to wander around on our own. Graveyard at the Rock of Cashel, County Tipperary. Dublin, the last place we visited on our trip to Ireland, was not my pint of Guinness. In fairness, the immense beauty of the Irish countryside was a tough act to follow, and the weather during our two-day stay in Dublin, raw and gray, certainly did not help. Maybe with more time and a bit of sunshine I could have discovered the city’s hidden charms, but to be honest, most of its “highlights” did not do much for me. Particularly disappointing was the pricey and overly-commercialized self-guided tour we took of the much-touted Guinness Storehouse: time and money that would have been better spent drinking Ireland’s famous black beverage in the cozy comfort of a pub. That said, it was nevertheless in Dublin that we had one of the most memorable experiences of our trip to Ireland: a tour of the Jeanie Johnston. 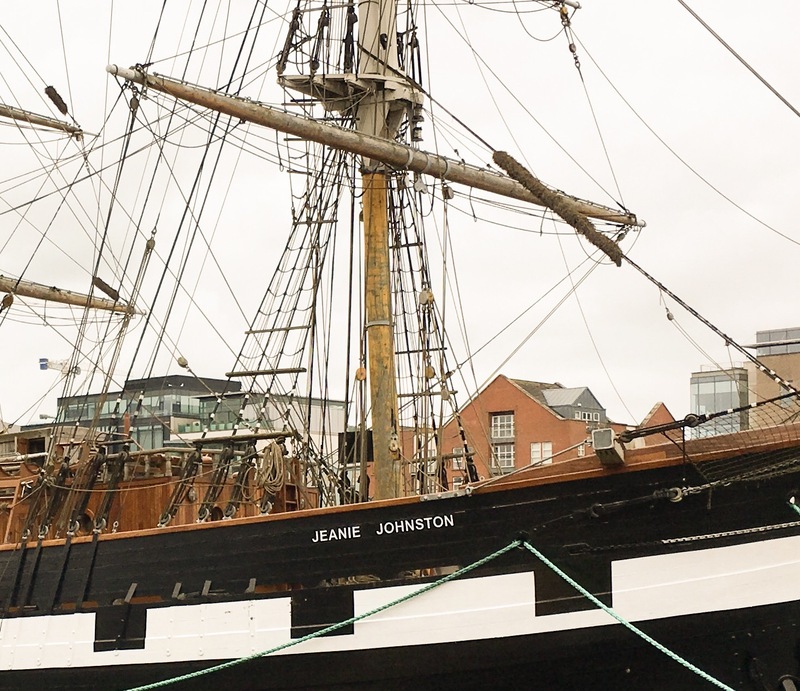 Moored along the north side of the River Liffey, in a part of the city known as the Docklands, the Jeanie Johnston is a replica of a 19th century “coffin ship,” as the vessels used to transport poor, starving emigrants out of the country during Ireland’s Great Famine were called. Unlike most such ships, which typically lost around 30% of their passengers to disease and starvation, the Jeanie Johnston did not lose a single life on any of the 16 emigrant journeys that she made between 1848 and 1855, delivering some 2,500 people from Tralee, in County Kerry, to the United States and Canada. As we learned, the ship’s impressive track record was due largely to its captain, who took steps to establish healthier living conditions on board, including hiring an experienced doctor to treat sick passengers. Most of the tour took place below deck, where emigrants endured much of the seven-week journey to North America in the dark, cramped hold of a ship built to transport cargo, not people. An expert storyteller, our guide brought the famine years to life through the individual stories of some of the Jeanie Johnston’s actual passengers, like the woman who gave birth at sea on the ship’s maiden voyage, the widowed father travelling with his 11 children, and the 12 and 15 year-old brother and sister who left home on their own. 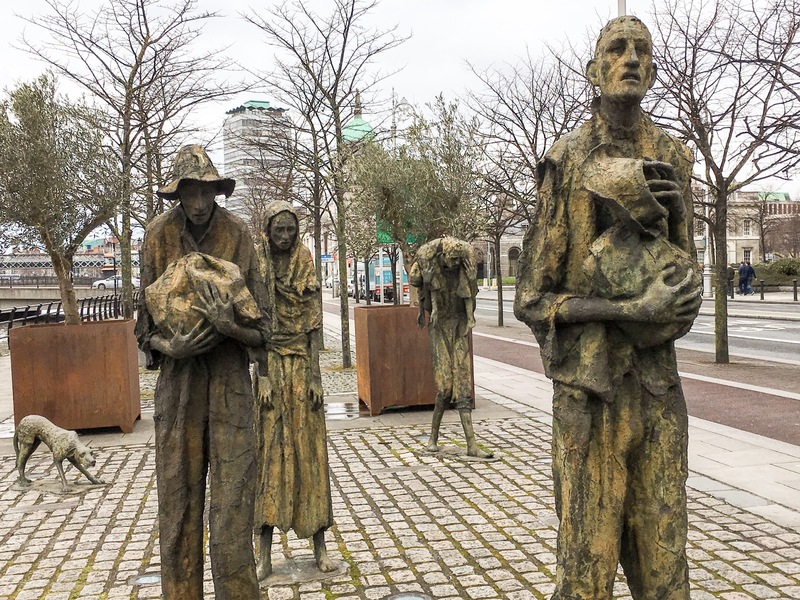 Memorialized in eerily lifelike wax figures, they inhabited the dimly-lit space around us, their expressions reflecting the despair and sadness they must have felt as they traveled across the Atlantic in search of a better life. 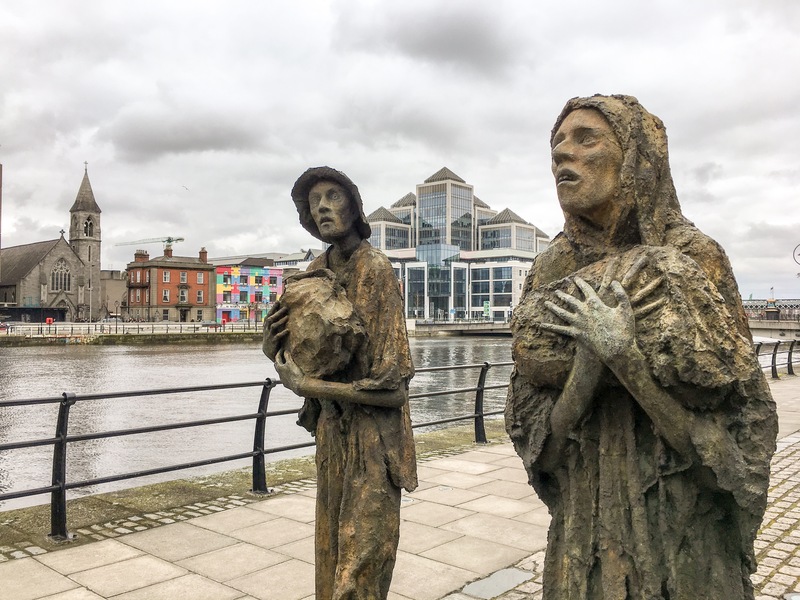 Famine Memorial along the River Liffey in Dublin. As we taxied slowly down the runway at Dublin Airport on our way back home, I saw through my window an older gentleman in a tweed cap, his car parked along the side of a parallel road. With one hand cupped over his eyes, he waved with the other at the giant 747 in which I sat, presumably wishing a final goodbye to loved-ones headed off to New York. Yet somehow this, my last glimpse of Ireland before the plane took off, felt like it was meant for me. “Safe travels, don’t forget us, and please come back,” I imagined the man in the cap to be saying. While there are places I’ve visited where a small taste was enough, Ireland is definitely not one of them. Hopefully, one day soon, I will return to indulge in more of the feast that is the beautiful Emerald Isle. This piece about Ireland makes me hope that I can travel there one day. I’ve been to Ireland twice and agree it is a most special place! Your stories and photos of your trip are beautiful.